Editing, Deleting and locking the threads. UVdesk Ticket System allows its support staff or the agents features like editing, deleting, pinning and locking the ticket threads for the better management and maintaining confidentiality. The support staff or the owner can edit any ticket thread on the ticket system. Select the ticket thread which you want to edit and on the left side, there is More Options menu. 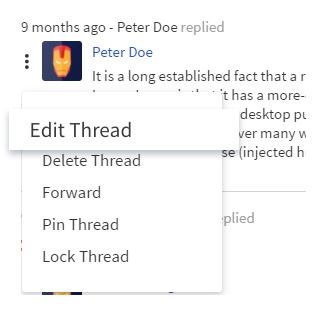 Click on More Options menu and there you will see "Edit Thread" option. Select that option and edit the content as per the need. The support staff or the owner can delete any ticket thread on the ticket system. Select the ticket thread which you want to delete and on the left side, there is More Options menu. 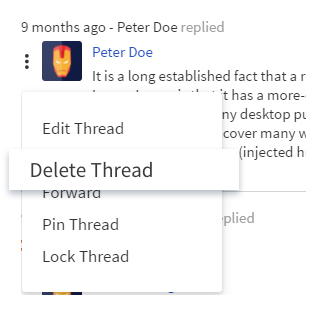 Click on More Options menu and there you will see "Delete Thread" option. Select that option and delete the ticket thread as per the need. The support staff or the owner can pin or unpin any ticket thread on the ticket system. Select the ticket thread which you want to pin and on the left side, there is More Options menu. 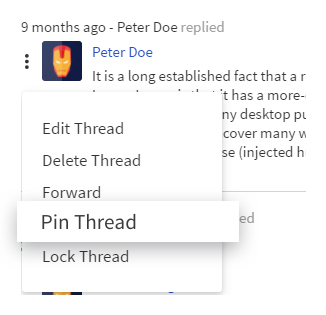 Click on More Options menu and there you will see "Pin Thread" option. Select that option and pin the ticket thread as per the need. The support staff or the owner can lock or unlock any ticket thread on the ticket system. Select the ticket thread which you want to lock and on the left side, there is More Options menu. 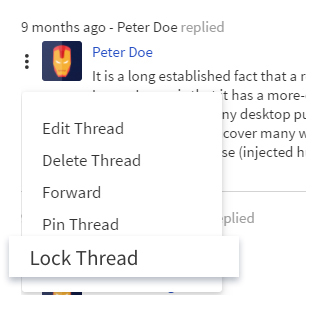 Click on More Options menu and there you will see "Lock Thread" option. Select that option and lock the ticket thread as per the need. In the case of any doubt, you can email us at support@uvdesk.com and we will surely come up with a solution.